This is the next in the series on Four Dimensional Flourishing. 3. that Hashem has a plan for the world. The flourishing currency is purpose. The habit we need to create is service and the deterrent is comfort. In Derech Hashem, the Ramchal teaches that Hashem created the universe for the purpose of bestowing the greatest good upon man; closeness to Hashem. Closeness in the spiritual realm is defined by the degree of resemblance. For this “greatest good” to be most significant, the one enjoying it must earn it. Hashem, therefore, created the world with elements of perfection and deficiency and gave man the means to move toward perfection and avoid deficiency. To maximize the challenge, He created man with a soul inclined toward the spiritual and a body inclined toward comfort and the material. Hashem gave man the commandments, through which he can consciously subjugate himself to God and reverse his inclination towards the material. The Ramchal goes further, explaining that when we do non-commandment activities, like eating and sleeping, with the motivation of maintaining our body in order to serve God, then they also become acts of perfection and fulfill the purpose of the world. As such, everything that we do has the potential to be aligned with the ultimate purpose of creation. The major deterrent in the Spiritual Dimension is comfort. We are inclined towards the material and to rest and relaxation. We don’t want to exert our physical, emotional and mental capabilities. The key is to focus on serving God as the most significant aspect of our lives. Sometimes, even when we are doing things that are inherently spiritual, such as saying a brocha, we lose track of the tremendous opportunity to come close to Hashem and fulfill our purpose. Let’s look at how we can transform the brocha over washing our hands into an opportunity to flourish. The “Baruch” makes us aware that Hashem is the source of all blessing. The “Atah” focuses us on the fact that we’re talking directly to Hashem. Yud Kei Vav Kei, signifies that Hashem always existed and is the source of all existence. “Elokeinu” says that He is the authority over all creation while “Melech” brings that authority to a more concrete Kingship. “HaOlam” recognizes that His Kingship extends to the entire universe. “Asher Kid’shanu” says that Hashem has set us apart with a special mission and holiness. “B’mitzvosuv” tells us that we accomplish our purpose through the commandments. “V’tzivanu Al Netilas Yadim” awakens us to the fact that, in this very moment, I am fulfilling that purpose with the mitzvah of washing my hands. Thirteen, sometimes mumbled, words which when said with a little thought, awaken us to the fact that we are currently performing an act that is a part of fulfilling the purpose of creation. We can multiply this amazing experience a hundredfold with all of the brochos and mitzvos we do each day. When we flourish in the Spiritual Dimension, we will often also flourish in the other Dimensions. That’s because our focus on purpose in the Spiritual Dimension makes our actions meaningful, which is flourishing in the Mental Dimension, and the knowledge that we are connecting to the Master of the Universe and doing His will produces profound happiness, which is flourishing in the Emotional Dimension. In summary, the path to purpose in the Spiritual Dimension is to focus on our constant service to Hashem. The deterrent is comfort and avoidance of exertion in our actions. We can overcome this deterrent if we bring to mind that with proper service, we are fulfilling our purpose in creation and flourishing in all four Dimensions. The components of the Mental Dimension consist of acquiring knowledge, developing deeper understanding and applying that knowledge and understanding. The flourishing currency in the Mental Dimension is meaning. The habit we need to create is mindfulness. The deterrent is distraction. 1. Acquiring knowledge about things and ideas by reading, listening and observing. 2. Developing a deeper understanding of our knowledge and deriving new ideas. 3. Applying our knowledge and understanding as practical wisdom by forming opinions and making decisions. The goal of these processes is to see things as they really are and then spend our time and energy on the most significant and meaningful things. The currency of the Mental Dimension is meaning, and meaningful things are defined by how significant they are. Doing meaningful things is often outwardly focused because we find that helping others has significance. For example, health care providers and teachers often find their occupations to be meaningful because they are directly helping others. If we want to live with meaning, we need to pay more attention to the significant things in our lives. The problem is that we are often distracted by insignificant things. This fact is starkly portrayed in a popular video which shows people glued to their smartphones while their significant others become invisible. You ask your son to go to the bank to make a deposit. He responds that he’s about to go to his friend’s house and asks if he can make the deposit afterwards. The simple response would be to tell him to make the deposit first. But the simple response isn’t always the best one. There are many factors you might want to consider before you make the decision, such as: the importance of the deposit and what would happen if he forgets to make it, showing him that you trust him to keep track of time, giving him the responsibility to juggle social and family responsibilities, etc. Many times we are too distracted to think deeply about our interactions with our children. But these, sometimes seemingly small, interactions are the bread and butter of the meaningful activity of parenting. In summary, the path to meaning in the Mental Dimension is to act with mindfulness so that we can focus on the more significant things in our life. The deterrent is distraction. We can overcome this by using our thought processes to actively determine and pay attention to what is significant. The components of the Emotional Dimension are positive emotions, specifically love and awe. The flourishing currency is happiness. The good habit we need to create is connection and the deterrent is ego. Our Sages tell us that the key to enduring happiness is a feeling of completion or wholeness which can come from an appreciation of what we have, accomplishment, or building good relationships. We’re going to focus on happiness generated by good relationships. Jewish mysticism teaches that our positive emotions are rooted in love and awe. Love is a connection to another person based on an identification with his positive qualities. Awe, along with its honor and fear components, is a connection based on a recognized hierarchy. Relationships between man and God and between child and parent have strong components of both love and awe. The husband and wife relationship is built mainly on love with some mutual components of awe. The relationship between friends is built primarily on love. Giving is not limited to physical things, it includes advice, showing you care by inquiring about the other’s welfare, and offering words of encouragement. Learning from others includes not just subject-matter information but appreciating insights offered from their unique vantage point. The main deterrent to creating positive connections is our ego. As Dr. David Lieberman says “The body wants to feel good, the ego wants to look good and the soul wants to be good”. When we are driven by ego, we want to look and feel superior to others.The Mesillas Yesharim says this is an extremely difficult challenge to overcome. The desire to be on top leads to the negative traits of envy, pride, honor and anger, each of which builds barriers to connection. The key to negating the ego is humility. In his famous letter, the Ramban prescribes that we should view every person as greater than ourselves. If the other person is wiser or wealthier, we must honor him for that. If he is neither wiser nor wealthier, we should realize that he is less guilty than we are, since we have fewer extraneous pressures to sin and we have greater knowledge of Torah. This approach will allow us to subvert our ego and develop better relationships. A friend walked into a local store where a wealthy man was talking to a clerk. He wasn’t being nasty but he was clearly asserting his authority over the clerk within the discussion. The clerk was responding appropriately, although he didn’t seem happy about it. When it was our friend’s turn, the clerk, seeing that she was a young woman, started asserting his authority over her and was not being so nice about it. Our friend, who had recently learned these concepts, recognized the hierarchies at play, understood the workings of the ego and kept her emotions in check, allowing her to respond without anger. In summary, the path to happiness in the Emotional Dimension is to increase our connection to people, primarily by giving to them and learning from them. The deterrent to these connections is our ego. We can overcome the need to feel superior by developing the trait of humility. The components of the Physical Dimension are the five senses. The flourishing currency is physical pleasure. In order to make pleasure purposeful and to prevent it from becoming destructive, we need to develop the good habit of self-control. The deterrent to purposeful pleasure is desire. The two most common pleasures are eating and sensual pleasure. These are also the areas where people have the most problems. Let’s use eating as our example. We have to eat to survive and our hunger drive reminds us when we need to eat. The challenge is choosing which foods to eat and determining when to stop eating. Here is where we need to do battle with the deterrent of desire. Desire attracts us to the best tasting food, regardless of nutritional value, and we want more of it and we want it now. We have to control our desire with the conscious thought that eating during the week is primarily for health and energy. When we do that, we make the pleasure that we get from eating purposeful. This raises the physical act of eating to the loftier Emotional Dimension since successfully exercising our self-control creates happiness. And that happiness lasts longer than the physical pleasure of food which is only good until the last bite. One way to develop self-control over the way we eat is to maximize pleasure by eating slowly and being mindful of the aroma, taste, texture and satiation of our food. Imagine you’re at a barbecue and you’ve just started watching your weight. So, you take a hot dog, which is approximately 100 calories, cut it into 15 small pieces and eat each bite slowly, focusing on all the pleasures. The guy next to you grabs 2 hot dogs with buns for 450 calories and finishes them in half the time it takes you to eat your one dog. At the end of the day, who had more pleasure? It’s fair to say that you experienced more pleasure savoring all of the pleasures of your one hot dog than he did gobbling down two. In summary, the path to healthy pleasure in the Physical Dimension is to make it purposeful. The deterrents are our inborn physical desires. By focusing on self-control, we can resist these desires and choose our pleasures with purpose. Both secular and Torah sources discuss that human beings experience the world in four Dimensions: Physical, Emotional, Mental, and Spiritual. For example, eating occurs primarily in the physical dimension. Love is an emotional experience. Learning takes place in the mental realm. And prayer is a spiritual pursuit. Although we experience the world in all four Dimensions, they are not equivalent. There is a hierarchy which starts with the Physical Dimension, where we are focused on self and which becomes increasingly less self-centered as we move towards the Spiritual Dimension, where we are focused on God. Let’s take a look at some examples of this. The pleasure of the Physical Dimension is completely self-focused; that chocolate cake tastes great, but that’s only because I like chocolate cake, it has nothing to do with anyone else. Emotional happiness, achieved through positive relationships, involves me and at least one other person. When I move up to finding meaning in the Mental Dimension, I’m even more outwardly focused and involved in pursuits that help others and improve the world. Finally, purpose in the Spiritual Dimension places God at the center of all my activities, it’s about what He wants, not what I want. The lines between Dimensions are porous, meaning that flourishing in one Dimension often creates flourishing in another. Indeed, that’s one of the goals of Four Dimensional Flourishing, to take an activity in one dimension and raise it to a higher level. For example, eating a delicious Yom Tov meal is a physical pleasure that becomes spiritual when I’m focused on the fact that this is the type of pleasure that Hashem has commanded me to have on Yom Tov. At the same time, two different activities might cause flourishing in the same Dimension but they may be of a very different quality. For example, eating a delicious weekday meal will provide physical pleasure but might also make me happy, which is an emotional state. Doing something meaningful, like volunteer work will make me happy as well, but it’s easy to see that these are different types of happiness. The happiness from pleasure ends after the last bite, while the happiness from meaning is more deep seated and enduring. The chart below summarizes the Four Dimensions and the overview that we have just covered. You might want to refer to the chart as we discuss each Dimension individually. Two friends are watching a football game. One is a huge football fan and he gets excited about every aspect of the game: how the offense and defense lineup, the movement before and after the snap, clock management, perfect execution and the small miscues that make big differences. The entire three hours of the game are amazing for him. His friend likes football but is not a tremendous fan. He mostly cares about the big plays, the great catches and the bone-crushing hits. They’re both watching the exact same game, but their experience is completely different. Life is like that as well. Some people live amazing lives–every moment infused with purpose, meaning and joy– and some people just can’t wait to get home for a quick supper, some web surfing and sleep. Then there’s the place where most of us probably live, somewhere in the middle. But we can all move towards amazing. What does an amazing life look like? It’s a life where we experience physical pleasure without being controlled by it. A life where we reduce our anger and envy and develop happiness, and deep connections to others. It’s living in a way that finds significance and meaning even in seemingly mundane endeavors. It’s having a clear understanding of our purpose and living each day in accordance with that purpose. We can consistently move closer to an amazing life by creating four key habits and eliminating four key deterrents. Let’s dig deeper. In 1980, Dr. Martin Seligman developed Positive Psychology which focused on actively increasing happiness, rather than the traditional focus of psychology: treating mental illness. Dr. Seligman defined three types of happiness: The Pleasant Life, increasing positive emotion through pleasures, activities and attitudes; The Engaged Life, using your specific individual strengths in your work, love, friendships, leisure and parenting; and The Meaningful Life, using your strengths to serve something larger than the self. In 2010, Dr. Seligman expanded the focus of Positive Psychology by adding healthy relationships and accomplishments to the happiness mix. He called this expanded focus: flourishing. We’ve been working on Four Dimensional Flourishing for a number of years in response to the fact that, despite positive psychology’s increased focus on life-satisfaction and well-being, the average person seems to be living an increasingly less amazing life. In this work, we have defined flourishing from a Torah perspective and have created a practical framework and process to increase flourishing. The first step on the road to a flourishing life is understanding that all human experiences fall into four dimensions, physical, emotional, mental and spiritual. 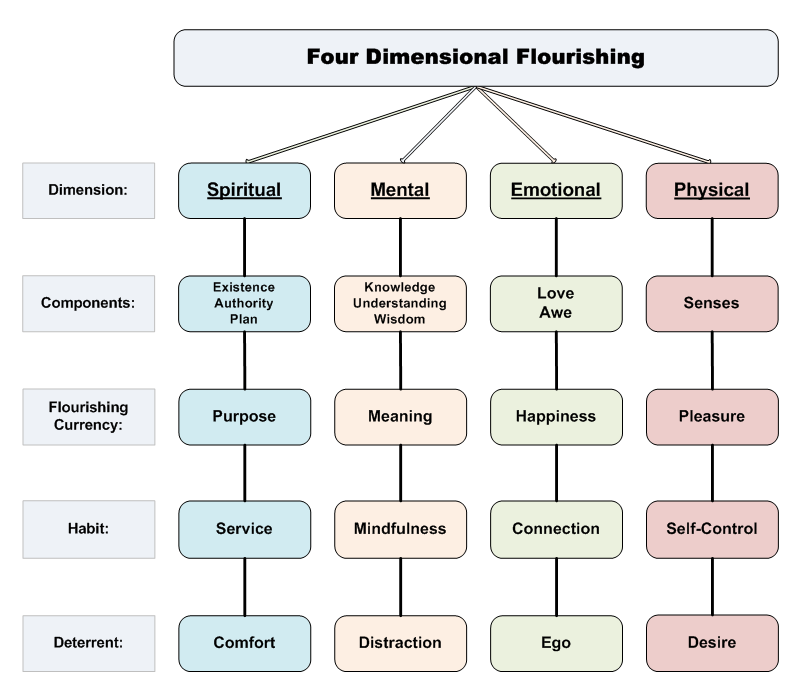 To flourish, we need to know the goals we are striving for in each dimension. In the physical, we are looking for pleasure. Emotionally, we are in pursuit of happiness. In the mental realm, we are searching for meaning. And in the spiritual dimension, we seek to fulfill our purpose. In each dimension, there is a specific habit that is critical to flourishing and a major deterrent that can distance us from flourishing. In order to increase the degree of flourishing we experience in our lives, we need to develop these habits and address these deterrents. We have enumerated a five step process to integrate flourishing into our lives. The process transforms this material from interesting information into life changing sustenance. When we use this process to integrate Four Dimensional Flourishing into our lives, we will be living amazing lives on a moment by moment basis.